Jim Sharman directed The Rocky Horror Picture Show (1975) won 3 movie awards and was nominated for 4 more. Around the time this film came out in the 70s, it was a very ambitious release. 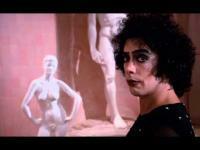 The Rocky Horror Picture Show is a comedy musical horror film with so many undertones. The Rocky Horror Picture Show is not a film for everyone. I remember trying to watch it a few years ago and just switching off to watch something else. This movie is just about as campy as it gets and terrific performance of Curry and the rest of the cast is fantastic. The musicals are entertaining, and the pacing is right most of the time. But it all draws down to "if this is your type of comedy?" Avg. Rating: 3.52/5 stars from 118,763 users.